3 Life is Short. Do Stuff that Matters. 8 Volunteers are love in motion. 9 Fight the good fight! 10 Sticking our necks out to make a difference. 11 Committed to the Cause. 12 A full heart does not mean full pockets. 13 Wherever there is a human being, there is an opportunity for a kindness. 14 What the mind of a Man can conceive and believe, he can achieve. 15 We make a living by what we get, but we make a life by what we give. 16 We have the cause. You have the effect. 17 We all must work to make the world worthy of its children. 18 Volunteers, a precious resource we can not afford to lose. 19 Volunteers make the world go round. 20 Volunteers make each day brighter. 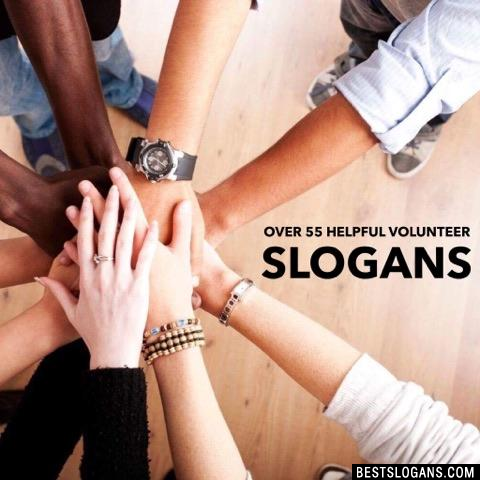 Can you think of a good Volunteer Slogans we're missing? Or come up with a clever one of your own. Please share below.